Several key players return as starters after having season-ending injuries in 2017, including quarterback Zach Bednarczyk. How they integrate back into the lineup will determine if the Wildcats bounce back to a winning season. With the loss of leading receiver Taurus Phillips (29 catches, 426 yards, six touchdowns), senior Jarrett McClenton is the only returning wide receiver who had at least 10 receptions in 2017. No returning receiver had a touchdown catch last season. The opportunity is there for whoever steps up. Because of the demographics of the Colonial Athletic Conference, Villanova rarely has long road trips, but this year's schedule shouldn't feature much travel lag. Coach Mark Ferrante said only three games will require the Cats to stay in a hotel. The first six games will be crucial to the Wildcats. After opening against FBS program Temple, four of the next five games will be against teams that had losing records in 2017. 'Nova needs at least four wins in the first six games. Three of the final five will be against preseason Top 25 teams. 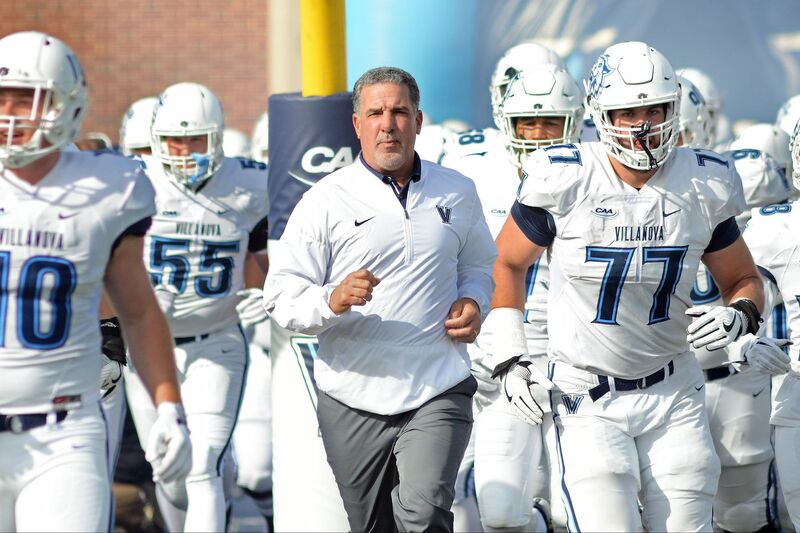 With six CAA teams ranked in the preseason Top 25, including Villanova (19th), the Cats have a difficult road to the playoffs. 'Nova avoids Elon (13) but plays at Stony Brook (22), New Hampshire (9) and Delaware (16). No. 2 James Madison will come to the Main Line. Villanova running back Matt Gudzak carrying the ball against Temple last season. Ethan Greenidge, Sr., OL, 6-4, 335: With great size and quickness, the former basketball player has 33 straight starts and should be a Day 3 pick in the 2019 draft. Rob Rolle, Sr., DB, 6-0, 195: A 2017 preseason All-American, Rolle returns from a season-ending injury. If he stays healthy, Rolle will be drafted. Zach Bednarczyk, Sr., QB, 6-1, 200: He's the quarterback which automatically makes him a player to watch. Before being lost for the season to injury, Bednarczyk completed 85 of 121 passes for 1,068 yards with six touchdowns and no interceptions. Matt Gudzak, Sr., RB, 5-9, 200: Another player returning from injury, Gudzak averaged 5.1 yards on 39 carries with three rushing touchdowns. Has 10 career rushing touchdowns. Jeff Steeb, Sr., LB, 6-0, 215: He led the team with five sacks and eight tackles for loss, second with 91 total tackles. At Temple, Sept. 1. The Cats lost, 16-13, to the Owls last season. A season-opening win at Lincoln Financial Field would be a big confidence boost. At Stony Brook, Sept. 29. The Seawolves matchup will be the first of four games against teams ranked in the FCS Top 25. James Madison, Oct. 13. The 2017 FCS national runners-up are predicted to win their fourth straight CAA title. New Hampshire, Oct. 27. UNH is picked second in the CAA, but 'Nova will be at home and coming off a bye. At Delaware, Nov. 17. The CAA has had four teams in the FCS playoffs for four straight seasons. This game against the arch-rival Blue Hens could be for a bid.